"Bienvenue a la Avignon TGV" wakes me from part 16 of my never-ending nap. Unfortunately, my hopes of gazing out on the French countryside as we shuttle have been trumped by my inability to keep my eyes open. Well, we are supposed to be relaxing, right? So far we've relaxed about as much as we do on any international trip, which is very little. 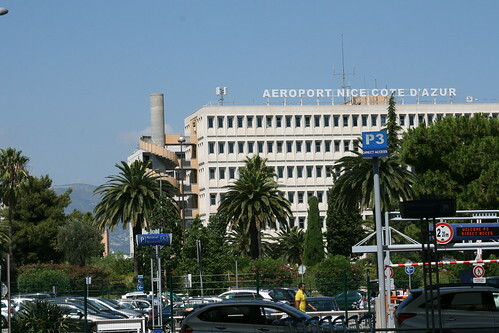 We arrived in Nice on Tuesday after breaking our own record of hours traveled. We stayed up all night Sunday-Monday packing and squeezing in the final moments of our wedding week. 4 a.m. found us at DIA after an informative ride with our hippy cab-driver/philosopher. His penchant for folk music and scraps of useless information kept us awake as I mopped my teary face with a paper towel. Although our departure seemed to be a successful one, our travel luck caught up with us in Atlanta where we were pulled from our flight to JFK after waiting for mechanical issues to be addressed, a delay I hardly noticed as I slept through most of it. Re-routed through Brussels, we spent several more hours in Atlanta before our business class Atlantic hop filled with champagne, filet and a solid six hours of sleeping. We rushed gate to gate in Brussels, confused about baggage and setting off the metal detector with my lingering wedding hair pins. We even donated our gifted bottle of champagne for our 'anniversary' to some helpful guides at security who were much younger and hipper than the cowboy hat bedecked ones at our Denver airport. We made it to the gate just in time to fall wearily in line with other travelers bound for the sunny Cote d'Azur, but were unfortunately turned away from our final leg of travel as we were warned that our luggage had not made the transfer and we were left with two options: to return to the airport and fetch it ourselves after arriving in Nice, or to wait for the next departure in an hour when we would arrive alongside our luggage. We waited for the next departure with a long line of passengers at the Brussels Airlines ticket counter with tested patience. Our flight was again spent sleeping as D. could hardly be roused to enjoy his cold pasta with prosciutto or marvel as snowy alps gave way to sparkling sea beneath us. Although it had been promised, when we arrived in Nice, our luggage did not. In fact our waiting in Brussels had little to do with our luggage which was currently making its own separate journey from JFK to Amsterdam and then on to Nice. Turns out we had been separated from the very beginning, and luckily, despite the threats from our Air Brussels gate agent, our bags would be delivered once they reached Nice. 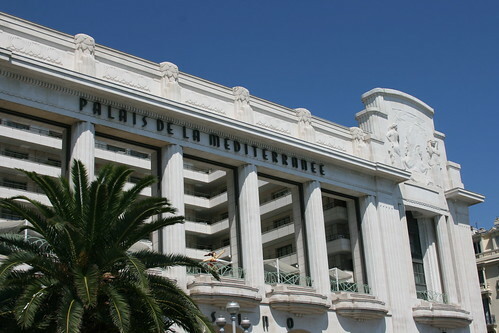 With that somewhat comforting news, we departed Nice's 60's Bond-esque tropicana airport and boarded city bus #98, bound for the Promenade Anglaise and our honeymoon residence, the Palais Mediterranee. 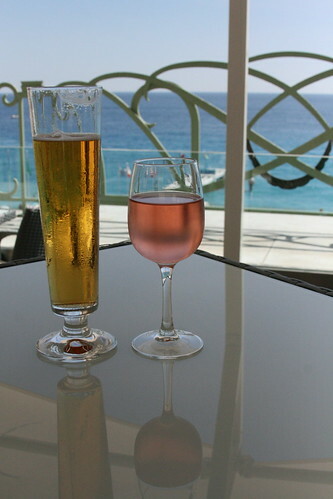 While we waited for our room to be ready, we enjoyed a rose (por moi) and a biere a pression (D.) on the terrace as we gazed out onto the shockingly blue water where swimmers frolicked and para-sailers were dramatically dunked. The Palais is a behemouth of a hotel (and a casino which we never visited) situated behind a massive, colonnaded, art deco facade. The original hotel has been scraped and replaced with a modern one replete with open air pool and the aforementioned terrace over-looking the sea on the third level where the ballroom/dining room once were. A few black and white photos depicting the Palais as it once was in the 1920's make its current appearance seem, well, disappointing. Although comfortable, to let an architectural artifact like that fall into ruin seems a total shame.